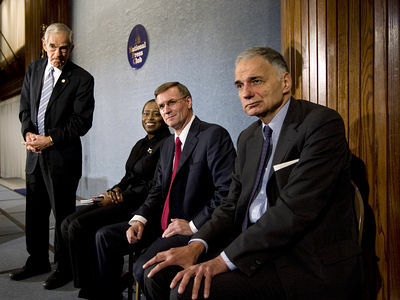 Ron Paul, the guy who endorsed Ralph Nader and Cynthia McKinney in 2008, is now possibly the Republican nominee in 2012? “Presidential elections turn out to be a charade more than anything else,” Paul said, and so he urged his supporters to vote for candidates who would expand the debate beyond the major party’s platforms. A phone call from McCain backer Phil Gramm yesterday was not enough to garner Paul’s endorsement and didn’t stop the Texas congressman from gathering the welterweights of the presidential race for an announcement of their common principles.